The RJ45COUP10PK 10-pack of RJ45 Inline Couplers offers a cost-effective option when you have multiple short Cat5e Patch Cables and you need to create longer connections between your networking devices. At a lower cost per unit, these RJ45 couplers extend the length of your existing Ethernet cables - a perfect solution for schools, and other organizations to avoid the cost of additional cables. 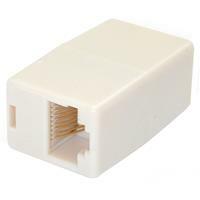 The RJ45COUP10PK couplers are backed by StarTech.com's Lifetime warranty.